I used a paper cutter together with a ruler for the straight parts and small scissors for the round corners. I may have to try a ruler when using a paper cutter. Despite my best efforts I can't quite get my cuts perfect. Thanks for the pointer! You got those rounded corners with just scissors? That's actually quite mindblowing to me. I wouldn't even attempt it because it would end so badly. How do you make sure every card is rounded the same so you can't tell them apart? Consistency and Scissors don't get along whenever I try to combine the two. For the final version I'm going to use one of these though, they have one at my photography school and they get you the best results possible. For a final release you may want to do this unless you can get the high-quality materials yourself. If you have your own way of getting high-quality card material I'd be curious about that too! Printing onto and cutting anything other than paper hasn't been a thing I've had much success with outside of using a 3rd-party vendor like the one I linked. Wow, and they offer the printing for quite reasonable prices as well, didn't expect that. Probably can't use this option, because I pretty much made up my own aspect ratio for them, lol. They won't fit onto any size they offer. My plan was to just print them at home, backsides would be done by using one paper twice and a bit thicker paper, or bring the files to a local print service if I want the best quality possible. Not sure if I will though, to play the game you don't really need some fancy paper n stuff, but we'll see. A good quality print would be nice though. You can easily resize them if you don't mind skewing them a little bit or changing border thickness. Depends how different your aspect ratio is from standard and if your graphics can handle the skewing. I'll leave that to you. That makes sense. For anything other than a final draft (aka anything can could still be changed due to ongoing playtesting) I'd just print it out at home. If the cuts aren't perfect I don't care because it's not a final draft. For my final draft I normally just get cards printed at a service like the one I linked and forget about the fiddly cutting work. It's true, you don't. It's just really awesome to play a homemade game that actually looks and feels like something you bought at a store. Good luck on your game! Have you playtested it much yet? Do you have any rebalancing or changes to make? Well, you guys can print the game in any way you want of course. I'm trying to make it balanced of course. There will be cards that are better than others (the movie one sharptooth for example will be pretty strong) but the goal (and pretty much only balance a game like this needs) is that every card can beat every card in at least one category. I've played these games a lot when I was younger. Dammit I wish I was still a mod because I'm online, right now, watching this guy spam the forum. I always wonder why anyone who sells stuff thinks that doing this is a good idea. Try not to worry about graphics too too much just yet if you can, at least in places where you may have to rework game mechanics if you find they don't work. It sounds like your game is very close to an existing game if I'm not mistaken? If so, you don't have many game design hurdles in front of you. If I'm wrong though and this is a unique game with its own rules, just be warned that you may have to change things like quantities of cards and some fundamental concepts that may require altering graphics. That's the kind of thing you can only find out by playtesting a game hundreds of times with different groups of people. Again, I'm not sure how original your game is. I'd just hate to see you produce a final version on nice, expensive paper with perfectly-tweaked graphics only to find the game has some minor problems that you could have ironed out with more playtesting..and now you're forced to redesign and reprint final drafts of cards. An existing game...well, kind of. Do you know top trumps? If not, top trumps exists for pretty much everything, cars, planes, my little pony etc. 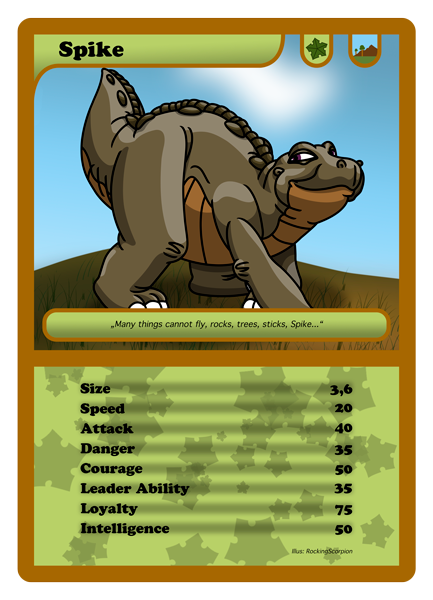 I would not be surprised if there is a Land Before Time Top Trumps already (well, google brought me directly to this thread, so maybe not). The system is very simple, you pick a category, name the number, and the opponent replies with his number in the same category. The higher number wins. It's also luck based, because you never know what cards you get or what your opponent has. To figure out the system that every card must be able to beat every card in at least one category, I just took a closer look to the values on a dinosaur top trumps game I own. So yeah, this kind of game does exist, over and over for a huge number of franchises and quite a lot of stuff that can be measured somehow, so I'm not doing something 100% original here, I'm just adding the LBT spin to it. won't happen here, I'll make sure of that. And while we're not exactly getting off-topic here, maybe we should continue this with personal messages, so that everyone who looks for new updates doesn't have to scan all the posts to see if they include anything. Sounds like you got it properly under control, RockingScorpion! Do you know top trumps? 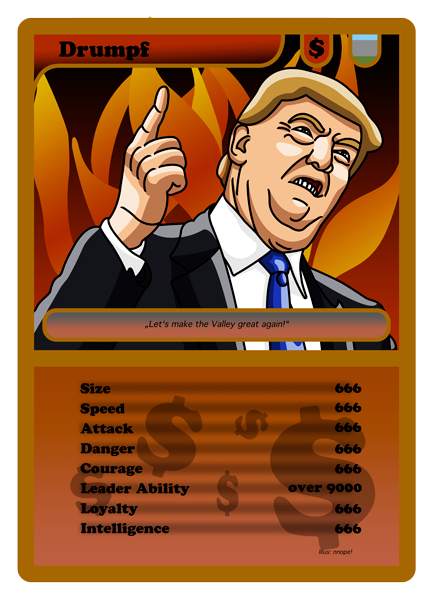 Not specifically but I've played trump-based card games before, including a board game called "Trumpet" which uses a similar mechanic. I think I get the idea. Okay, I see the scope of your project now. I just didn't want to see you biting off more than you could chew because I've been there and done that (See this whole subforum). BTW I'll leave it to you if you'd rather have this topic in Fanart or LBT Projects. I'm leaning more for LBT Projects since this is an LBT card game but it looks like it's primarily the art you wanted to convey to us so it's up to you. Fair enough! I didn't have anything else to say at this point so I'm done spamming for now! Take care and good evening! If anyone of you (started running around in circles screaming for help) wondered where this topic suddenly went, well here it is. action9000 gave me the idea to move it to this part of the forum, and after thinking about it, he has a point there. Also, thx for Malte for moving it. Now, enough of that, here's the new card. And while all the stuff about the cards and the cards itself of course will go in this topic, I'll post the different card artworks in my art topic in a slightly bigger resolution. Also, wow look at his expression, this would almost be good enough for a sarcasm/irony emote. That's it for now. 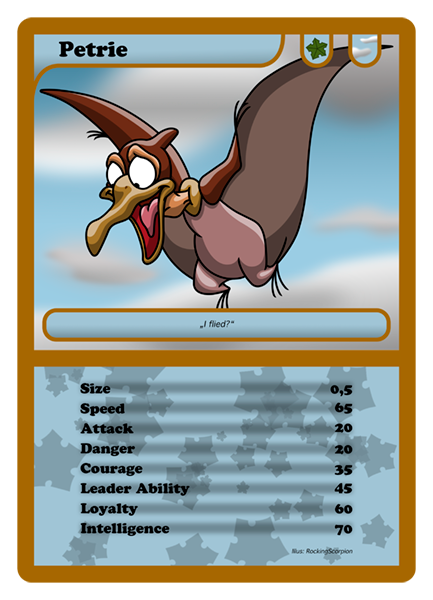 I do wanna make the Petrie card this week, but I'm not sure yet. He'll be the first card that won't have the ground as a habitat, so there is some stuff that has to be done aside from the card image only. But we'll see. I can't draw a stick figure, lol very good job RockingScorpion! I love your work! This is really Great Work RS Keep it up, can't wait to see the next card. Thanks for all those comments, I'm really baffled by the support this project is getting you guys are awesome. And yeah, Darkwolf, that Spike is based on the first movie though in the original version his eyes are closed. No, the blue color doesn't indicate that he's drunk (Don't drink and fly!) but that his habitat is the sky. The habitat symbol also changed from land to sky. Now the only things that aren't covered yet are cards for the habitat water and the omnivore/carnivore symbols. Those will come in time. Now, the whole gang is completed, time to move on to the secondary characters. Hope you like this one and until next time. The standalone image of Petrie will be posted in my fanart topic as usual. I would like to see full main characters cast of original movie first. @Snik: They will come at some point, but I'm working alongside the list I posted in the starting post of this topic. Happy April Fools Day and don't get pranked too much, everybody. Actual cards will come this week again as well. Edit: gone. That was easy, just had to delete some unused extensions, that stuff was hidden somewhere in those apparently. Shouldn't just been Trump's hair. Somehow I think if Donald Trump were a Magic the Gathering card he would be classified as a wall card. He probably would think of that as a compliment.